Hi Mike, what are you using to edit the coach lettering? Went back to Bluebell with the better half yesterday. Great day but both of us felt a bit under the weather by about 4pm and made an early exit. However it was a great day with plenty of activity and we got to ride in the period Southern three coach set (which was great) and the vintage four wheelers (which was also great but bumpy!). Both of us a feeling better today (just tired yesterday I guess) and I've been getting on with a bit more lining. No ultra ultra cruel close up today but when enlarged the locos in the picture are much larger than in reality. The rearmost cab end is my start on BR mixed traffic livery - I don't know why the camera has picked up a slight purple tinge to it, it's not like that in reality. You might notice some slight blooming on the paintwork. This is where I've either been removing slight lining blemishes or coxing paint into forming corners. Once it is fully dry I should be able to remove it with a ooo brush moistened in white spirit or, if worse comes to worse, paint over it with some of the base colours. 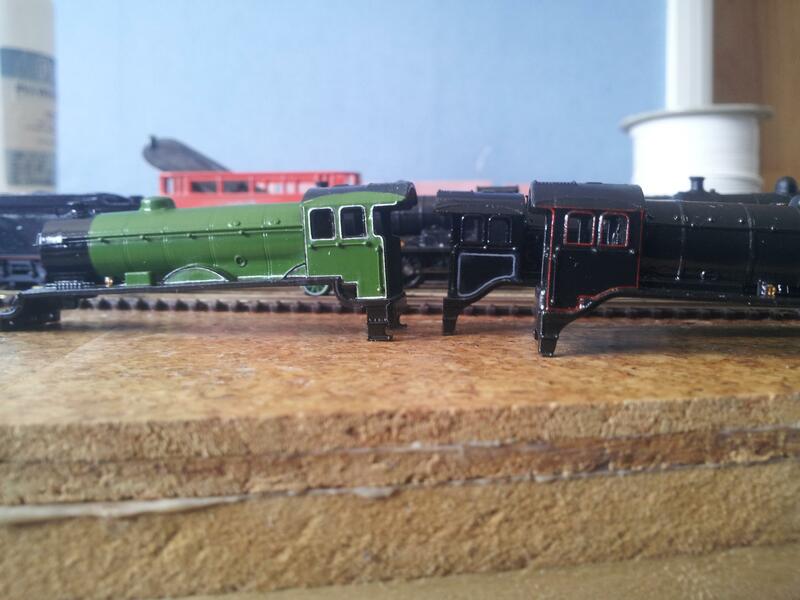 The two LNER locos have also had their buffer beams lined out in white but this needs a little more work once dry before they are worthy of being photographed. looking good Steve as ever. I have no idea. As you are much more experienced than I on that particular subject, I'll defer to your greater experience in this matter. Will you youngsters stop bickering and leave us old'uns in peace! Wheels have been repainted into their final colours using a mixture of bow pen (for the spokes) and brushwork around the edges. 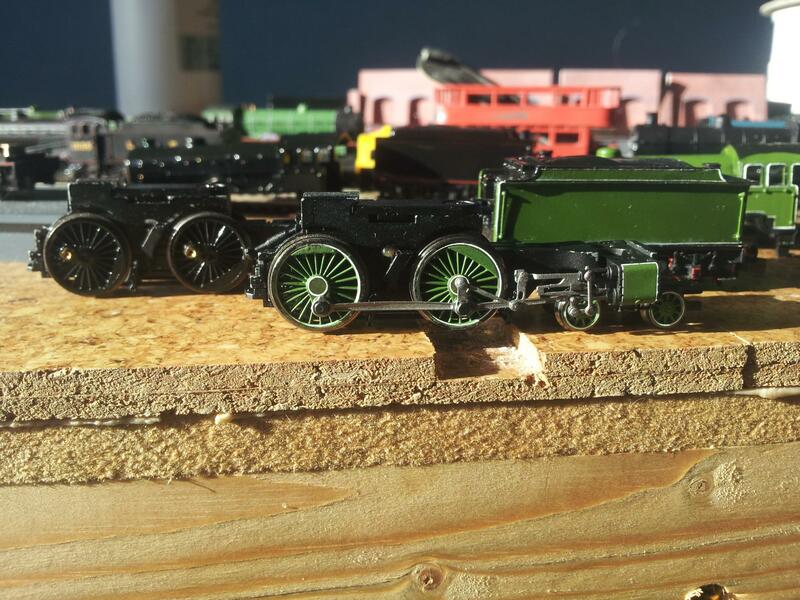 I'm particularly pleases that I've just about managed to preserve the original lining around the green wheels. The green driving wheel centres are yet to be given a coat of black and you can see the original green still. I've also repainted the side of the cylinder, the green should start a little higher but, again, I wanted to save some lining work by preserving what was already there. Pedantic time - this is entirely dependent on the size of monitor and resolution you're running at... Will be very different sizes on a 27" widescreen 4K than a 19" 4:3 at 1280x1024. Thank you guys, I'm amazed that these are coming along as well as they are. Good point regarding the size though Alan. On a modelling point - do observe closely the lining on K3 in BR days next to the bufferbeam. My prototype loco had very detailed lining in this area - not sure if all were like that, so worth checking the prototype loco you intend to model. 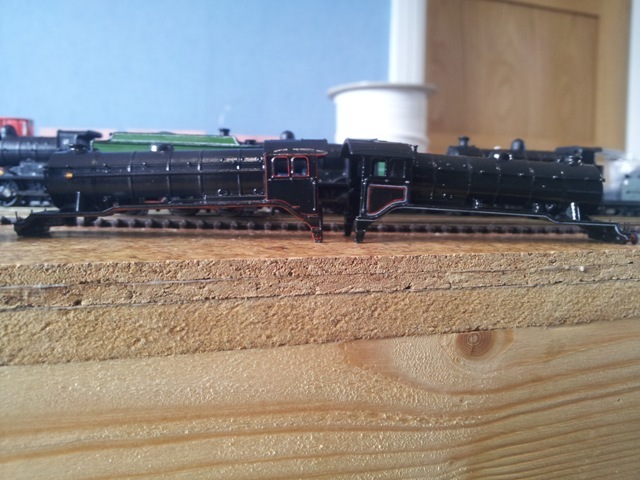 However, the coupled wheelbase is a bit too short to properly represent a J69. 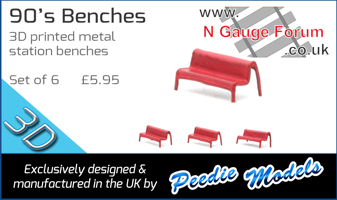 the Farish body comes out at 53.75mm or 1.06 times bigger. Factor in that the tanks are too high and the boiler is somewhat over fed and you'll quickly come to the conclusion that this is not a scale model! The Fleischmann chassis/wheels/rods are a million miles more plausible (if not precisely accurate) than Grafar's original teenie, gappy wheels and dog-bone rods, so I'd use them in a flash. If the over-length body bothered me, I'd take a mm out here and there with hacksaw cuts between the safety valves and tank vents, behind the top sandboxes and at the boiler/sandbox boundary. Personally, I don't think it's worth it, and a nice distracting livery on an "OMG-you've got one that runs" example would make this an exceptional model. Sorry about the lack of posts recently, been feeling a little low again. However today has seen some progress again in the form of boiler bands! My original plan was to create some decals by spraying some blank decal film with body colour and hand ruling the bands onto that. That was before I discovered some old Fox boiler bands in my bits and pieces box, so I decided to have a go with those instead. 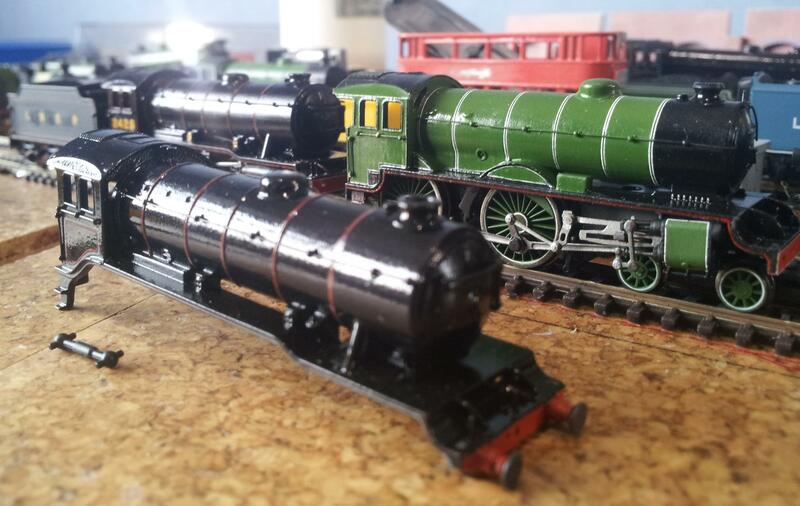 Sorry about the poor quality of the picture, although it shows up the LNER Shire reasonably nicely. The LNER K3 at the back is nearest to completion with just the buffer beam numbers to go before the final detailing can be added - you can just about see that it has gained an identity, 2425. This locomotive was recorded at Kings Cross in mid 1935 so is appropriate to my layout. The Shire and BR K3 still need to have their boiler bands finishing on the side not in shot. 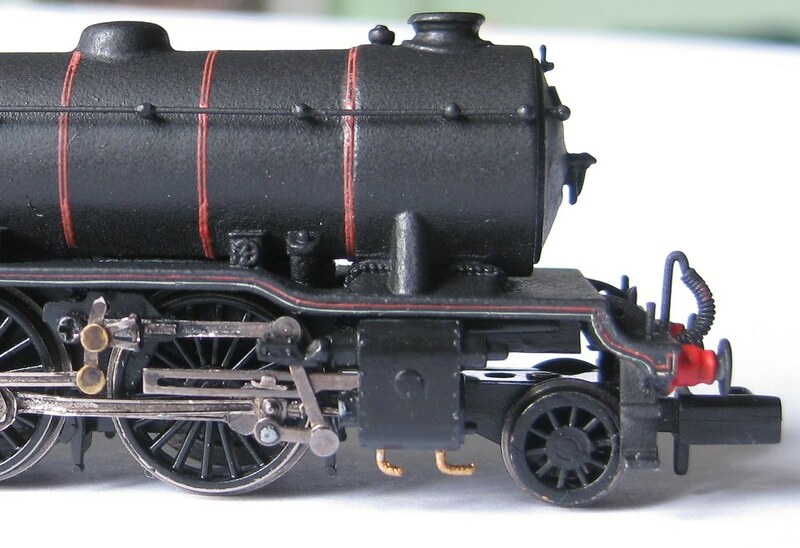 Having obtained another N class chassis as part of a swap, I'm considering modelling another K3 either 4000 or 4009 as they would have been around the mid 1930s. This will mean that she'll be somewhat different from 2425 being right hand drive and still being fitted with the original GNR cab (but towing an early group standard tender by this time). 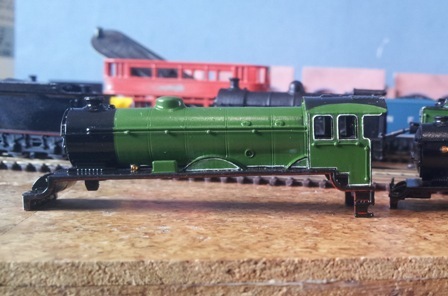 I'll take some (slightly) better pictures next week once I've finished the boiler bands and numbering.